The wildland-urban interface (WUI), where housing and wildland areas meet, and the fires that result are wreaking havoc on California as they increasingly cause hundreds of millions of dollars in damage each year and a growing number of lives are lost. Each year, the fires continue to grow in size and magnitude, while the accompanying losses become more severe. This problem is not going to be solved by more firefighters or firefighting equipment. There is no single, easy solution. But something must be done. 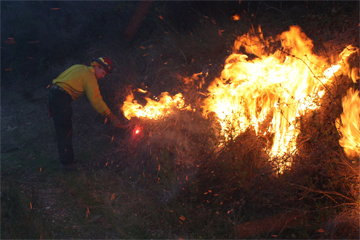 Cal Poly is working to establish an interdisciplinary Wildland-Urban Interface Fire Information, Research, and Education (F.I.R.E.) Institute to facilitate the research, education, training and outreach needed to address the catastrophic problem in California and beyond. The institute would facilitate a partnership between academia and external stakeholders. A holistic approach to reducing the impacts of such fires is needed; there is currently no such institute in the United States. Cal Poly faculty and researchers in multiple areas of study, such as forestry and fire ecology, city and regional planning, construction management, landscape architecture, economics and fire protection engineering, are already doing research to find ways to alleviate the impacts of urban encroachment on wildland areas, yet they are doing it individually or in small groups. The institute would unify that effort and provide a path to meet the needs of today’s society by partnering faculty and students with stakeholder organizations. Dan Turner, retired San Luis Obispo Cal Fire chief and manager of the San Luis Obispo County Fire Safe Council, is working hand in hand with Cal Poly to establish the institute. As both housing and commercial development continues to encroach on environments that are naturally dependent on fire to regenerate the ecosystem, disasters such as the recent Thomas Fire and mudslides in Ventura and Santa Barbara counties will continue to escalate. Fires in wildland-urban interface settings now represent the most frequent source of declared disasters in California and are occurring at an increased frequency. The complexity of these WUI fires exacerbates the problem – they require both wildland and structural fire protection, which has long been viewed as two distinct problems. The Wildland-Urban Interface F.I.R.E. Institute will combine the efforts of both to enable suppression and community resiliency. “This problem is not going to be solved by more firefighters or firefighting equipment,” Dicus said. In December 2017 the Thomas Fire burned 281,893 acres, destroyed 1,063 structures and left 26 people dead. In the months prior, a series of fires in Sonoma and Napa counties destroyed nearly 9,000 buildings and left 44 people dead. The devastation is not isolated to California. In recent years, similar fires in Texas, Colorado and Tennessee have destroyed nearly 5,000 homes and killed more than a dozen people. From 2011 to 2015, the average amount of damage caused by wildfires in California per year was $679 million. The average cost of fire suppression per year was $413 million. Those figures do not account for the larger economic toll that results in communities devastated by a fire, such as lost jobs and diminished resources. Yet, smart building designs and materials, land use planning, and management of wildland ecosystems as a prevention and management tool are just the beginning. Elements of political science, economics, emergency preparedness and response, and public education are also necessary. The solution lies in a partnership of shared responsibility between public agencies and the community. The Wildland-Urban Interface F.I.R.E. Institute will serve as the center of that collaboration. “Cal Poly is well suited to lead the effort,” Prince said. The university has the only Fire Protection Engineering Program west of the Mississippi. Ongoing research on fire-related issues, the economic impacts of fires, and best practices in landscape architecture and city and regional planning are already underway. Students work with real-world applications in both research and directly in local communities. 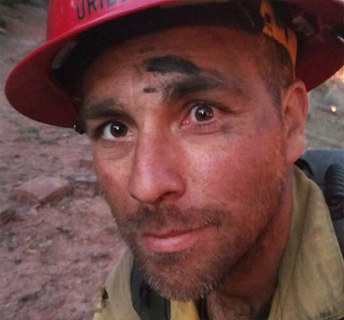 Rudy Uribe, 38, worked for the U.S. Forest Service in the Los Padres National Forest for seven years before enrolling at Cal Poly to pursue a master’s degree in forestry sciences. Growing up in the small Northern California area of Middletown in Lake County, Uribe experienced what it was like to live in a wildland-urban interface, with fires a common occurrence in his hometown. “I watched as we kept losing these communities over and over again, and I became interested in getting involved to see what I could do to improve the situation,” Uribe said. 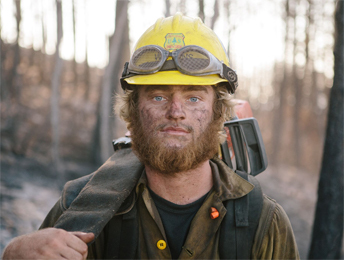 While working in the national forest, he worked the line, fighting fires deep in the forest. He decided to pursue a master’s degree to move into upper management and do more behindthe- scenes pre-fire planning and mitigation. Charles Watkins, 20, is a junior majoring in forestry and natural resources, concentrating in wildland fuels management. 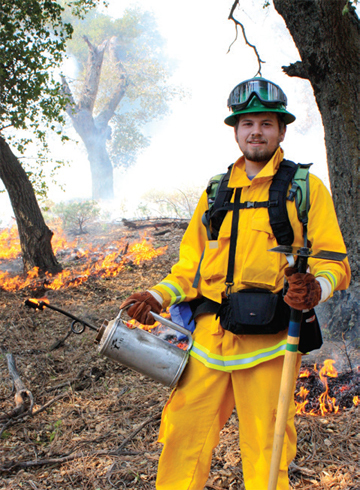 Each summer he works for the U.S. Forest Service in the Los Padres National Forest on a 20-person hand crew fighting wildland fires. Last summer he worked the Holy Fire, a wildfire that burned in the Cleveland National Forest in Orange and Riverside counties, burning more than 23,000 acres and destroying 18 buildings. He also worked the Box Fire in San Bernardino County and smaller fires throughout San Luis Obispo and Santa Barbara counties. Prior to that he was called during finals week to work the Thomas Fire in Ventura and Santa Barbara counties, where he stayed until Christmas Eve. During the Thomas Fire, he worked tirelessly above the coastal town of Montecito, trying to stop it from advancing beyond the forest. Yet the fire burned hot, eventually crossing fire lines. Visit the Cultivate Fall 2018 Page to read more stories.